I used to know it as Almaty right from my student days - the capital of Kazakhstan. But it was now Almaty and not capital but a buzzing business and social centre of the country, a city of nearly one and a half million people with a grand mix of races Kazakh, Russian, Ukrainian, German, Uzbek, Tatar and so many others. It all started on 2 August with an afternoon flight to Almaty. An Air Astana flight - Business class. A journey of 3 hrs and 35 minutes from Delhi, so cozy and comfortable. Kazakhstan Tourist Association people had sent a small bunch of three lovely maidens to receive and check us into one of the best of Almaty hotels. It was an early and somewhat hurried breakfast and then everything started to move. KTA maidens Olga, the interpreter and Shakira, the manager were already there with a cab to take us to Almaty and about. The day was a bit warm but very pleasant and perfectly endurable and became more so as the cab proceeded further to Medeo and Chimbulak. No kind of shivering and no need of warm cloths too. Chimbulak is a famous hill resort not very far from Almaty with all the facilities for a modern tourist right from ropeway to skiing. Hotels, restaurants and a cable car that takes you e most romantic experience at Chimbulak. As one soars up higher onto hills, a full view of Chimbulak emerges before his vision. Lush green mountains with beautiful trees sends one right into a fanciful world. The scenic beauty is just marvelous and the place is fantastically designed both by nature and a man. Chimbulak Alpine Skiing Resort is one of the most popular and the best skiing basis in Central Asia. The snow wraps Chimbulak from December to April and then it becomes a favourite place for skiers - professionals as the decent from Talgar Pass (the highest point here) is too abrupt. The amateurs also find it quite enjoyable as there are many facilities available to them such as convenient lifts and a mountain - skiing school. The place also has a children playground with a baby lift. Apart from this all the resort has a hotel, a restaurant, a bowling and a sauna. On our way back to Almaty we paused at Medeo. The Medeo is the most popular valley in Kazakhstan and is famous for the highest mountainous sports complex in the world. The skating ring here is the main attraction and why not? More than 120 world records have been registered here. One can see the Ice stadium and the colossal anti -mud rock flow dike from a special observation ground. The nature around Medeo is as fascinating as it is in Chimbulak. 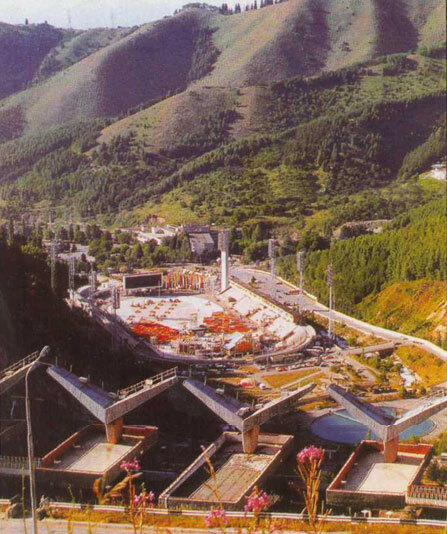 Because of Medeo and superb facilities and locations over there the city of Almaty has been nominated as a candidate to host Winter Olympics. Almaty is one of the fewest cities that meet the requirements for hosting such games. The location of the city and the surrounding natural environment are optimally suited for the hosting of "white" Olympics. Regular flights to and from Almaty are handled by the giants as KLM, Lufthansa, British Airways and others. 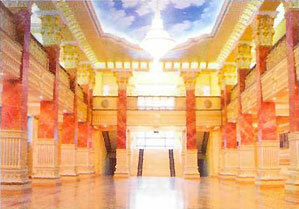 The Airports and two railway stations of Almaty are situated within city limits. A subway system is currently under construction apart from a well connecting transport system. The city has more than two hundred restaurants and cafes and in addition to a great many hotels suitable to all budgets and ranges. We were back in main city of Almaty by the afternoon and dined in a Ukrainian restaurant located on a roadside. One can easily watch the movements of people bustling around. Different people different features but something was uniquely similar. They all seemed frank, quite modern in their attires not giving much emphasis on their communal identity as we often see in India. One thing was quite astonishing about them they looked modern but original and not blatantly westernized as some pseudomoderns in our country do. The evening was the same as one finds in a cosmopolitan city - full of people, some returning to their homes, some shopping about and jaunting around. There were buses both diesel and electric quite neat and sound. There were trams also to share their burden and they all together made city transport system a very efficient and effective one. Roads were full of cars most of them of standard international brands Volvo, Audi, Mercedes and all that. All running speedily on one of the broadest roads in the world. And one unique thing to add - there was just about no two-wheelers, let alone cycles or rickshaws. 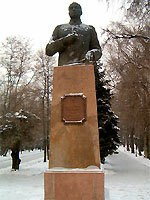 The city of Almaty appeared to be well organized and naturally disciplined. Day three started with a little breakfast and then set out for the Koktobe Mountain. 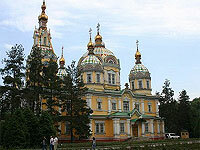 It is located on the top of Almaty more than 1100 meters above the sea level. A popular place for picnic and recreation in Almaty. It was a beautiful place to watch to the famous TV Tower of Almaty appeared so close from here that our eyes could have a genuine feel of its gigantic height. 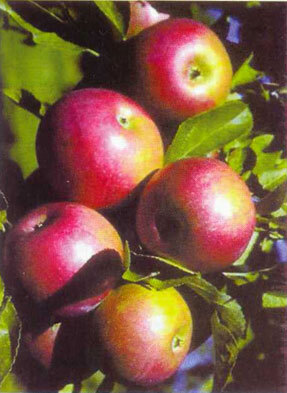 A big apple with pouring water welcomes you symbolizing Almaty or Alma Ata, father of apples. A large amount of travelers, a picturesque sight along with the sun going deep down in the clouds. Sunset you may call it but it was hardly dark as Almaty down there was now blinking more gloriously depicting such beautiful panoramic view of the city to be enjoyed by eyes and eyes only. Words can not justify the beauty. They are simply helpless. There too was a cable car, different from Chimbulak- quite modern and spacious, humming with Kazakh songs. It took us all down to main city from Koktobe in merely five minutes. The dusk had set in and the city was gleaming in a splendid glow. Once again the same roads with grand buildings new and classy and many of them skyscrapers. Again there was the Central Museum, Ramstore shopping centre, some reputed institutes, many newly built posh housing societies, Kazakhstan Hotel and then the big wide Republic Square, an architectural beauty, a place the mammoth structure of which depicts the strong will of a modern nation. Day three was not over yet. There was a sublime piece of architecture before us right in front of Almaty Hotel - Opera and Ballet Theatre, a classical example in itself - the building has an ideal composition a theatre should have. Yes, there was fatigue but not without a strange sense of pride - the day three had taken us through to one of the most planned and beautiful cities in Asia. Sun of the fourth day rose with a hectic light and on 6 o'clock sharp we set out to a 3-day special outing in and around Almaty region. Our Mercedes sped away on the outskirts of Almaty. The city was as orderly here as it was in the main town. Sizable houses with a simple but neat exterior and the same wide roads. No jams and congestion. We got smoothly out to head to our first destination. Altyn Emel National Park, Altyn ... a queer name but why not? The place was even queerish, a lonesome forest so long and wide. The way up there was equally identical. Huge plains with hardly any hamlet and if any, very small and thinly populated one. A sort of semi- desert or so. Bush and shrub just bush and shrub for miles and miles, dust and earth just dust and earth with a sunny horizon. Seldom there turned a Kazakh or two riding on horses checking a bright sunlight with their hats. It reminded me of Ladakh in India- a mountain desert as they say. It was wonderful in fact so wonderful that I started to loose my hunger. A kind of poetical appetite was taking that over. There was a cottage, a nice and sizable one though as solitary as the jungle was. We had reached Altyn Emel National Park. Folks at the cottage were nice, hospitable Kazakhs. We had our meals there with a cup of tea and then started for a wonderful sight adjoining Altyn Emel. Many an animal were visible on the way like mountain goat, antelope, ram and wolf. The heard of steppe horses - Kulans - ram towards us than quickly galloped away. Many types of mammals including some rare animals like the snow leopard (the symbol of the Republic of Kazakhstan), the wild cat - manul, the Central Asian otter happen to live there. They all roam freely in their exclusive kingdom. No fear- they were safe here preserved by the same mankind who has been their worst enemy from time immemorial. The sun was at its peak and also our enthusiasm. The land was the same - a long wide plain mostly inhabited by scrub only. It seemed to be a tireless marathon in a desert to find an Oasis. Yet the only contrast was the chasers who were not deer but human beings and the resultant mirage was even more satiating. The human deer were approaching to an enthralling hilly sight which was emerging broader and brighter by every mile. It was the Aktau Mountains - a scenic beauty of its own kind. Aktau (white mountains) are a kind of museum of the past. They have rare natural sculpture and are all different from each other. 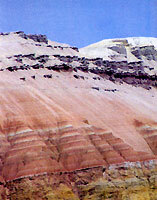 The mountains are 400 million years old, 30 kilometers long, and 1.5-2 kilometers high. These mountains are called "the pearl" of Altyn Emel National Park. Wide and broad, huge and gigantic the Aktau were not special for all that. Such things are very common to mountains. It was hue and countenance with a spread of nature made colors that gave Aktau so special a status among mountains. 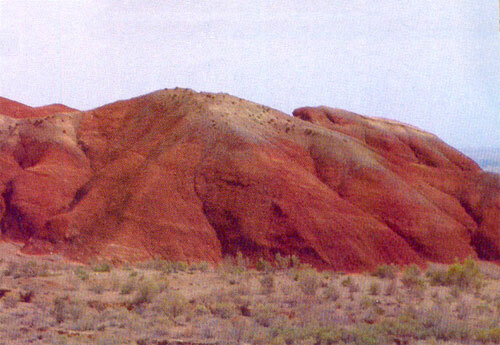 Red, pink, maroon, yellow and white -I had never beheld such a curious contrast in a single hill sight. The beauty of Aktau is a thing to be seen and felt - phrases and sentences can be of little use. The place was lonesome yet a scintillating sun combined with colourful hills gave it a brilliant look. There was a shed with a couch to take a temporary refuge. Sans these, there was no sign of human interference. It was only nature who ruled supreme there and that too in an ever persistent colourful mood. The best time to visit the park is October - November. It is at this time that it is most beautiful and most relaxing. Singing Sand Dunes, the next place in the tour itinerary was even unique if not more. It was a desert of sort surrounded with barren hills. Frankly speaking, I have never been to desert in my life, could it be the only reason to find it that interesting? No the place was wonderful, no less than that. Deserted as most of the deserts are but so mysteriously cool which they are not. These virtues are attached with hills in general. But then, it had every reason to appear like that. The place was covered with hills all around bare and barren, broad and dreadful. 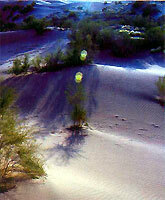 The most famous were dunes, great dunes of sand in fact known here as singing sand dunes. Do the really sing? Oh yes, they really do. The sand ridge is 3 km. long and 80 meters high and has extraordinary traits. God knows how it was formed in the ring of the small and large Kalkans. 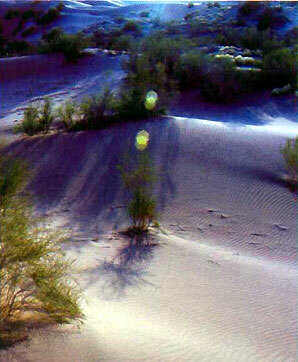 This type of natural phenomenon can be found in other places like Arabian desert or in Hawain Island and also in China. The sound of the sands is quite a mystery. When walking on the sand the sound reminds one of crunching of snow, an abrupt violent displacement brings about a sound that is similar to screech. From any of the three peaks of the sand dune, you can seethe Hi River and the Alatau mountains range. Our Kazakhstani mates had already started their ascension up the dune and it was left to me and my 40 plus legs to save the pride of India. The poor Indian had no choice but to follow. I soon started to enjoy this all and very soon made all that up. It was a marvelous sight and all of us enjoying it by raising voices filled with a winning emotion. Human sentiments are hardly different be it Indian or Kazakh. Then abruptly that came to my notice. It was when we all took to slipping down the dune the music played on. Slow, melodious with a bit of tremor. Who was playing it? Of course, the nature a lovely, enamoring nature around us and this time in the facade of a desertly dune. I was thrilled and may be more than that. All of us were. It played on as we slipped and it paused as we stopped. Such a rare experience. To hell with age and all, I was back to my romantic teens. All of us were back to forest in our cottage, the nice people had once again cattered to our vegetarian taste. Tea, biscuits, toffees and a plate of dry fruits were also there on the table as usual. All of us were tired but my mind was still roaming about colourful hills of Aktau, around mysterious sand dunes, the singing one. I came out for a walk. The cottage was located right inside the jungle, a part of Altyn-Emil. There was a fair of stars on sky - thousands of them, so lucid and brilliant. It was a night with a difference. Jungle, stars, solitude all combined with a scary sound of crickets; so awesome yet so fantastic. The ensuing day was taking us to yet another fascinating destination. We were back on the road again leaving behind Altyn Emel. The road was at first rugged then a bit bumpy and finally and quite abruptly became very smooth as our vehicle went on and on to one of Kazakhstan's world famous tourist places. 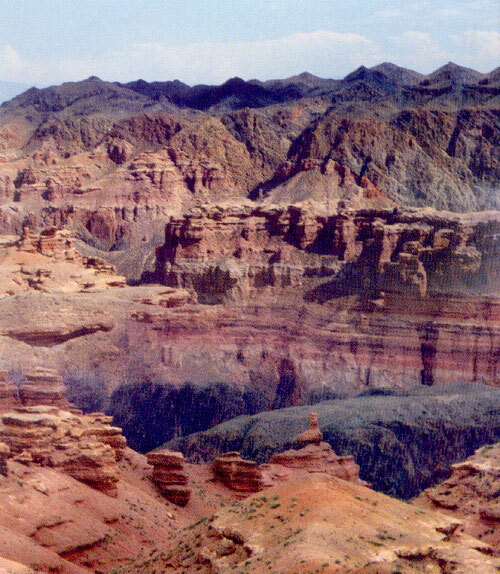 We were closing on to Charyn Canyons. They were red in colour most of them and held such a sight before me as I never saw before. All of us were amazed including Priya who had been to grand Canyons of America. The sight was stupendous. After many a thousand year processed through water and then only nature could produce such a marvel, a wonder of sort that was present before us. They are popular as the Red Canyons also and are 3 km in length and nearly 100 meters in depth. Charyn Canyons are almost 30,000 years old and are said to be one of the most exotic and enthralling gorges in Central Asia. In the bosom of the canyons, one can still find one of the rarest flora representatives - the relic ash tree which survived the glacial period. We angle, even went deep down but still the appetite of our vision remained unfulfilled. We would all be very happy if time had stayed on a little at Charyn but were constrained to pack up. So we had to leave Charyn... but then, we had to leave Aktau and Altyn Emel also. Such are the ways of the life. 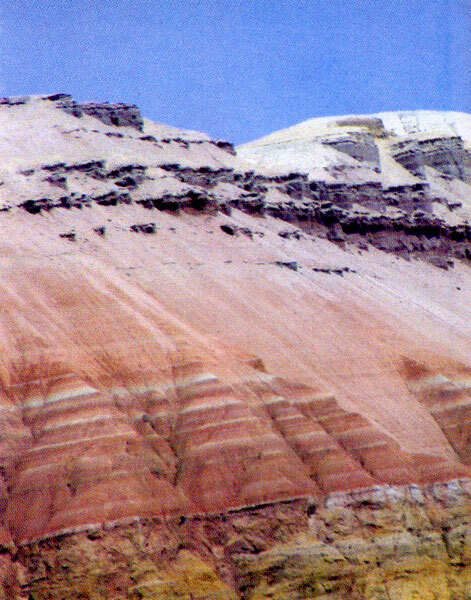 We have to move on despite everything as waters here at Charyn also had to, leaving behind such wonderful memoirs but nothing else. Next leg was different at least from last two days. No sand, no dust and absolutely no ruggedness. The scene was now shifting to fascinating mountains covered with snow up at the Zenith and with lush green trees at middle. The bottom side was not dusty and sandy anymore, it was fertile. The beauty of the region never ended there. It persisted with every turn at every road and culminated in the place called the Kolsai Lake, our last sojourn out of Almaty city. 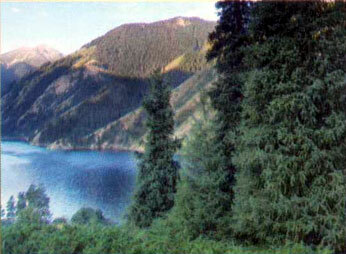 The most scenic lakes in the mountain range of the Kungei Alatau are the Kolsai lakes. They consist of three lakes: the Lowest, the Middle and the Upper Kolsai. Each lake has its unique charm. Surrounded by the mountain ridges, the Kolsai lakes, famous for their crystal blue waters, are a habitat for royal fish - rainbow trout. The bungalow type hotel we were to stay in was very comfortable, had all the amenities a tourist need and that too on a height like this. No less than 5 km drive from the downside. It held a panoramic view of the Kolsai Lake which was lucidly blue covered with mountains all around big and beautiful having wooden cottages scattered here and there. I went down the hill with Anil and Priya to have a feel of this watery beauty. Kolsai reminded me of Kashmir, the hills and water were no less romantic than that. A perfect one for honeymoon couples - to enjoy the love and that too in the company of a nature equally charming as your beloved. Kolsai, I must say was no less than a paradise. Lush green mountains- tall, beautiful trees and cool, serene waters adding to the supreme tranquility of one of the loveliest places I ever saw. I, like everyone would have liked to stay at Kolsai forever but a tight itinerary took this dream away at least for the present. Even on our way back the dream continued to haunt me till my eyes opened to yet another beauty. The place next was also a green and mountainous one. Not a very long drive from Kolsai, quite comfortable too as the way up there was full of scenic beauty and finely laid roads. A river began to form before our eyes and slowly took its fuller shape. That was the Turgen River and this particular place was world famous the Ili-Altau National Park on an area of over 200 thousand hectares equalling the total of Monaco or Mauritius Island. The altitude of the park ranges from 600 to 5000 meters from the sea level. There were tents and stalls everywhere on the vast banks of Turgen. A nice place for a picnic and, yes with a rafting option. The Turgen River was dancing down right beneath us - as pure as other rivers and lakes we came to view here. 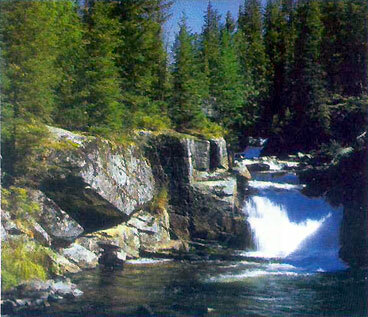 But we were not so fortunate as to rest on a rock midst or around the cool, pure waters of Turgen. We had to perform a more manly task, woman included to scale the height of a hill nearly 2 km high, a steep one on top of that. Hard as it might be but all of us were soon climbing up for the Bear Waterfall. It was nice to be there anyway. Not only the fatigue of climbing up vanished at the site of the Bear Waterfall but a lively mood also took that over. Cool water effect? Yes, perhaps only water in all elements has such inherent capacity. All hearts were glad and every face was relaxed. For the first time we shared our feelings with our Kazakhstani mates on a sheer human level and not as a tourist. The trend continued on the way back to Almaty. The 3 day long Marathon had come to an end. Cars, buses, trams, traffic and people. The city of Almaty was the same as we left it. The change had occurred somewhere else. Yes, in our minds. Just few days before we came to visit a country a vast country area wise, a growing economy after Soviet rule with some tourist places as every state has and that was all. But just 5 days and there was a drastic change. Now it was a beautiful country with a modern approach toward life yet not blindly westernized. So many races and religions but no friction. 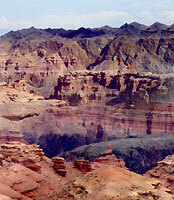 And such superb places for a tourist Chimbulak, Altyn Emel, Charyn, Kolsai, Hi-Alatau and, God knows, how many others. Not to forget Almaty as a city - a fine placement of nature supported with an excellent management by its people. It is a complete city of a consummate nation. The penultimate day was all about the city of its buildings, parks, marts and, yes its night clubs and casinos. Let us commence with holy places. First of them was the Central Mosque, quite big and spacious. A nice making but the beauty was the fine application of blue colour rendering all its purity to this holy shrine. The second in this series was the Zenkov Cathedral, an architectural beauty from all angles difficult for the eyes as they sort of dazzle with the sheer magnificence it offers. The surrounding about the cathedral is very lively-flying pigeons, skating children and passionate lovers sharing their lovely moments. Appended to that is big Panfilov Park, a perfect place for leisurely jaunt. A fine collection of flowers adds to the fanciful atmosphere all around. Adjoining this are two more attractions. A War Memorial with a huge statue for Second World War martyrs and a Museum for music lovers, in all, this place is just complete to enjoy your leisurely time. A late lunch at an Indian restaurant "Namaste" and then our destination next was TSUM - a modern mall, Green Bazaar was first on the roll, primarily a fruit and vegetable market added with meats and dry fruits. It was a crowd mart with a variety of goods - mobile, television, camera, home appliance, crafts. Out there was a gallery for painting and a good restaurant. A nice colorful place to visit it was. A little halt at French tower an imitation of Eiffel tower at Paris famous for perfume trade and then it was time to check into "Astana International Hotel" - out last point of stay for the tour. Ideal lights, lovely exciting music, melodious songs and fine artistic performance. This is not about a movie or play. It is all about a traditional Kazakh restaurant Zheruyik. An expensive but an excellent one of its kind. It was packed with people both Kazakh and others. Everyone was in a musical mood. There was warmth and pleasure all around. And one thing was more-a kind of chill was slowly entering into my veins, the chill of sadness, the sadness of leaving this all tomorrow. The life is always like this. We have to move be it Almaty or dear world. It was day eight, the day of departure to motherland. The flight was in time. The KTA girls handled everything with ease and perfection and in no time we had cleared the immigration. A cordial wavering of hands from both side and the trip was over. Everything was selfsame in the plane which was about to take off. The beautiful city of Almaty lying in the lap of a lovely nature was still visible though in a smallish shape from window of the plane. But so many things were now a memory- just memory. The plane had started to take off and the things down there were becoming tinier to my eyes. Good luck to you the dream city. Good luck to you the land of bewitching beauty. Good bye, Kazakhstan. We will come back. We must.